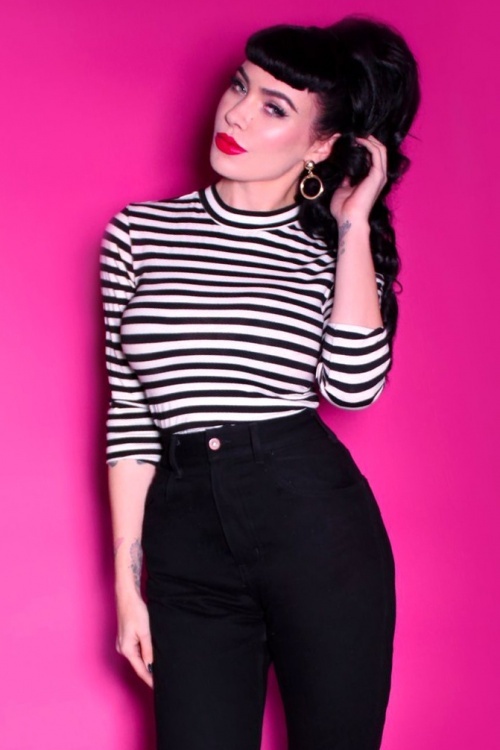 Be a real bombshell in this 50s Bad Girl Top in Black and White Stripes, designed by the gorgeous Micheline Pitt! This top has simply become one of the best I own, after I wore it at work on Saturday. It's a very stretchy tee-shirt material flattering all curves in the right area. It even makes me look slim, though the stipes are horizontal ! Great quality and a simple stripped top that would go with absolutely everything. It's so good, I went back on Top Vintage the next day to get it in black too... and I want all other colors if they can make it to the website. The pin is so cute ! I wore it for 2 days and everybody noticed it ! I'm happy pins are back to life these days, this one is surely good quality with glittering red lipstick. I'm a huge lipstick addict, so I had to have it, along with the skirt. To sum up, this outfit fits my body and my personality. And one last word for Top Vintage boutique : You rock ! Fast shipment (and for free) to France, as usual ;) With gifts and everything well packed. Thank you for existing.